NATIONAL HARBOR, Md. – The moment she heard the word Thursday, Charlotte eighth grader Akshra Paimagam knew she was in trouble. This was Round Five of the 90th Scripps National Spelling Bee, being held at the Gaylord Resorts and Convention Center. Paimagam was one of 34 students left on stage at that point, out of an original 291 spellers who participated in Wednesday’s preliminary rounds. “Panettone,” said Jacques Bailly, the pronouncer. “Panettone?” she repeated, hesitantly. Her father, Premnarasu Paimagam, looked on nervously from the audience. Gathering her thoughts, the speller scribbled on the palm of her left hand with her index finger. Still seeming unsure, she gave it a go. “P-A-N-N-O-T-T-E-N-E?” she asked the judges. The dreaded bell for a misspelling rang in answer. “I thought I knew the word, but questioned myself, and… I guess that was the wrong answer,” she reflected later. Panettone is a traditional Italian sweet bread served at Christmas. Paimagam, a 14-year-old student from Randolph Middle School, thanked the judges and left the stage, stopping to gather her jacket from her seat. 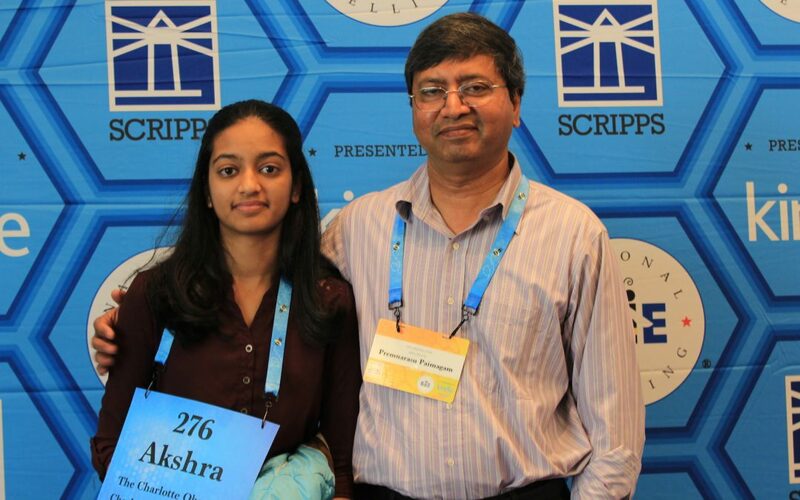 It was the same one she had worn to the 2015 National Spelling Bee, when she finished 39th. She hasn’t washed it since. Students can participate in the national bee only through the eighth grade. Eleven million students started out in local competitions. For now, the spelling whiz wants to relax for the rest of the summer. But relaxing for her would mean “probably take up competitive swimming,” she said. Her long-range goal is to become an oncologist. “I would like to help people,” she said earnestly. She loves biology and especially enjoys reading science magazines, hoping these will help achieve her goal.